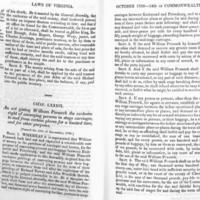 This act from the General Assembly granted William Pennock a government contract for a transportation company. Having a reliable way to transport people and goods across the state is important for a healthy economy. By granting this contract, the General Assembly is ensuring it can regulate an essential service. 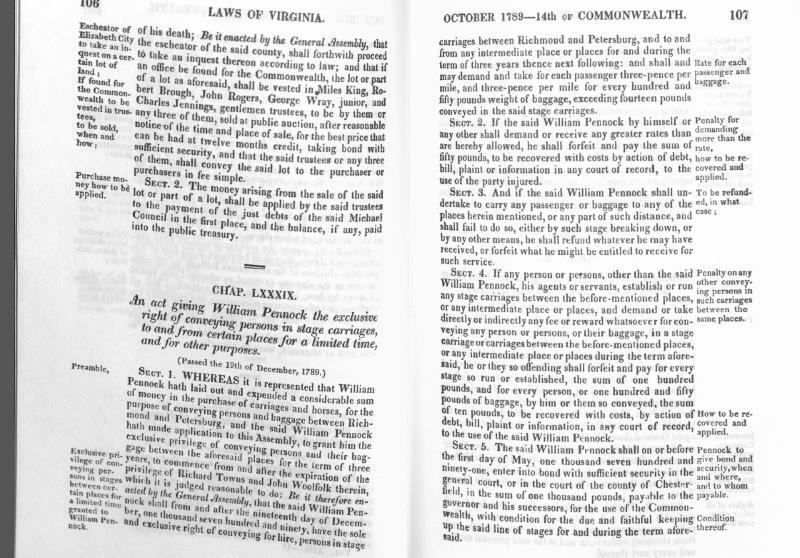 Citation:Statutes at large of Virginia (1619-1808), Compiled by William Waller Hening, 1809, call number KFV2425.2 1619, Manuscripts & Special Collections, The Library of Virginia, Richmond. Analyze: What incentive does the government have to grant exclusive contracts? Analyze: What are the advantages and disadvantages of this contract for consumers? Current Connections: Can you think of any modern companies with exclusive government contracts? In Their Shoes: Imagine you are a stage coach operator; what arguments would you make to try to convince the General Assembly to hire your company? 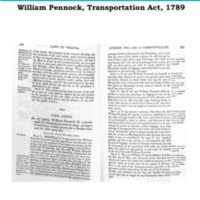 “William Pennock, Transportation Act, 1789,” Document Bank of Virginia, accessed April 21, 2019, http://edu.lva.virginia.gov/dbva/items/show/140.